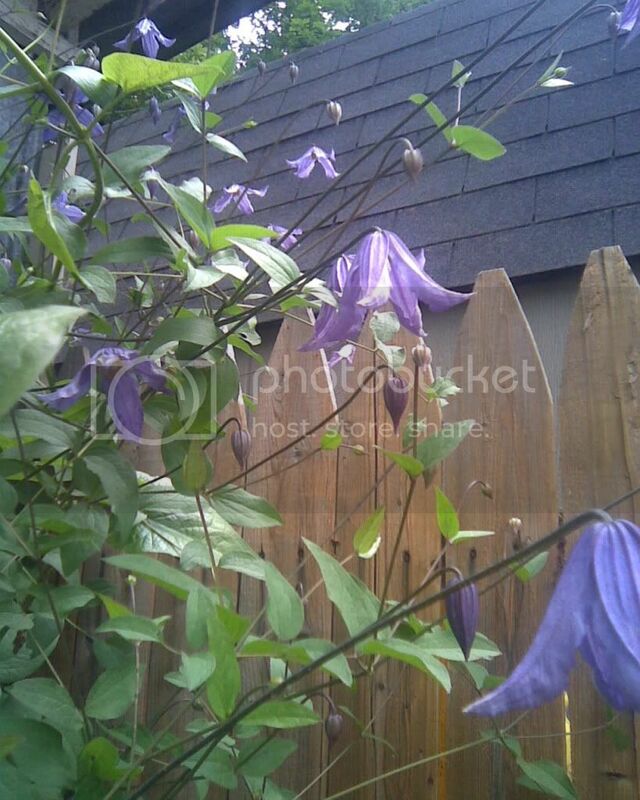 Clematis in full bloom - anyone else have photos of yours? Don't remember the name but is an older variety. Well, I just went to photobucket get some of mineto show you, and they are down for maintenance. Tomorrow? I have a picnic table full of plants, plus two rose bushes that have been waiting for the rain to stop and finally tomorrow it's supposed to be sunny and clear. If the ground isn't all mud and I get them planted, I'll try to remember to post clematis pictures! do u ever cut this one back or just leave the old wood? It is an early blooming clematis, and I cut it back to old wood within three feet of the ground. The plant always gives this kind of bloom on new growth early in the spring. This is a vigorous vine that will grow to 20 feet during the summer. I cut it back to the three feet height so that with new growth the early bloom reaches a little above the window to the right. One has to be careful about pruning or cutting back clematis however. With most early blooming varieties, I think that cutting back to old wood may cause the loss of the spring bloom. absolutely stunning! I have planted three this year, and hopefully they will grow to be half as beautiful! Very nice, Alex.... boy are you right on prunning time... there seems to be a different rule of thumb for each clematis variety. What an absolutely beautiful vine!! Any advice on pinching back to cause mine to bush out and control the height? Will I be causing more harm than good? I have mulch and snow-on-the-mountain to shade the roots and it gets full sun. P.S. I have 4 clematis but none are worthy of a picture.....yet. 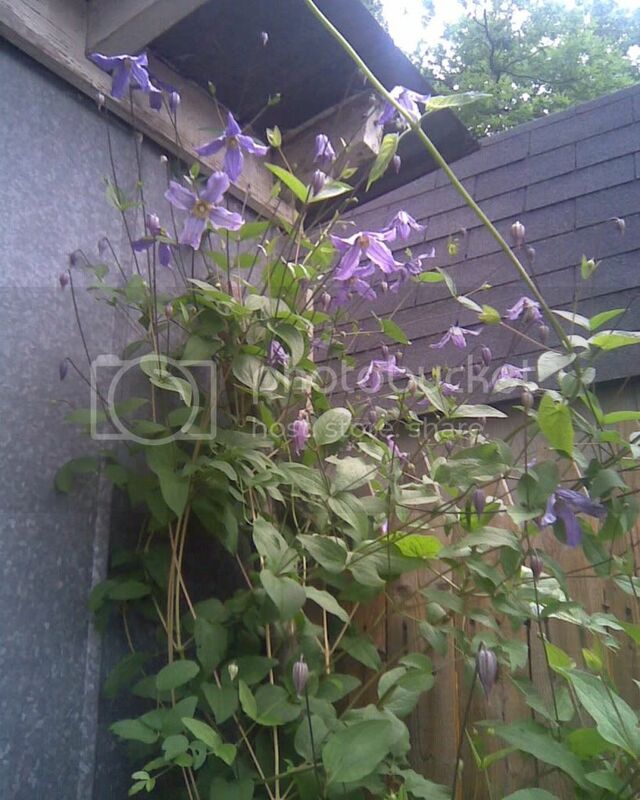 This is the only mature clematis that I have, though do have several one and two year old vines. 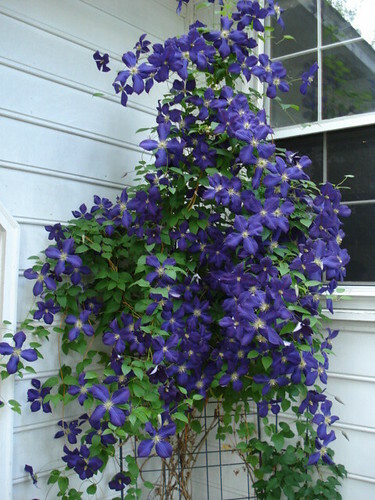 You should identify your clematis as to type one, two, or three and prune it accordingly. If you overprune, the only negative will be loss of bloom for one season. If yours is the type that bloom on new growth, then pruning will be not harm at all as is the case with mine. I prune it late winter, and in the spring it grows rapidly and blooms on that new growth. Here's my Etoile Violette--still lots of buds that haven't bloomed yet as you can see. And over to the far left is one Nelly Moser that wants in the picture, too. And while I was out there, this little guy caught my eye. He looks like a toad and not a tree frog, so I don't know what he was doing so high up in the trellis. Lovely clematis, lovely frog. Don't know the species of tree frog but I see an occasion one like yours and much more often see a gree variety. The trees just sing with the critters during certain times of th years. Tree frogs change color to match whatever they are sitting on. Clematis are some of the most satisfying plants in the garden, IMO. Sarah, I wondered if that could be the case. I used to have a pet chameleon who did that. Do all tree frogs have those little suction cup toes? This one didn't seem too. plkelly wrote: Here's my Etoile Violette--still lots of buds that haven't bloomed yet as you can see. And over to the far left is one Nelly Moser that wants in the picture, too.